ASICS Gel Kayano running shoe series – not what they used to be? Early 2007 I bought my first real running shoes. My choice fell on ASICS Gel Kayano 12 (Code: TN600) which was a current model of the Gel Kayano series at that time. 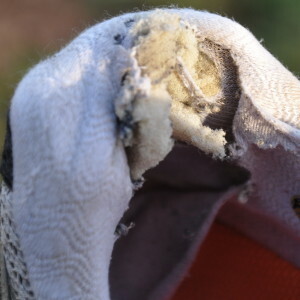 Since then, I ran roughly between 3000 – 4000 kilometers with these shoes. When they started falling apart in 2013 I decided to renew them, though still keeping the old ones, for garden jobs. For several reasons I chose to stay with the same series from the same maker. Of course the model has changed: they were now at 19 (Code: T300N) and counting (I think 20 was already existing). I ran about 1000 kilometers since then. Gel Kayano 12 from 2007, today. Gel Kayano 19 from 2013, today. Some time ago I noticed that the tissue of the back-inner-part, where the Achilles tendon is sitting, started ripping apart, on both shoes. It wasn’t until today that I realized the importance of this part of the shoe: it scratched open the skin of the my Achilles during my run. I think the shoes have become unusable. Kayano 12, after 7 years. Kayano 19 – after one year. Yes, the left one is the Kayano 12, 7 years old, and the right one is his younger brother. I’m not an tissue expert, but I clearly see that the tissue used on the Kayano 12 is much more robust than the one of the 19. I don’t want to speculate about the reasons for this degradation regarding this product – although I could rant for hours. Instead I will look for solutions asking a question on fitness.stackexchange.com. 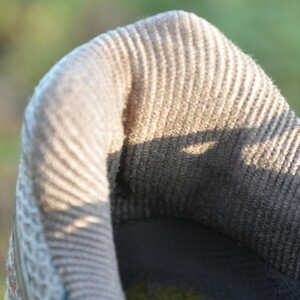 This entry was posted in Fitness and tagged product quality, Running, shoes. Bookmark the permalink.